Very unusual olive color crystal 18" necklace with rhinestone catch. Beautiful white and clear beads braided together, 18" long necklace. Black seed bead 24" necklace. Western Germany red crystal bead 19" necklace. 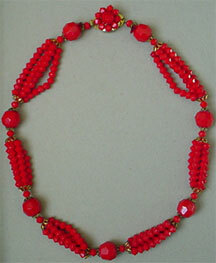 Faceted red bead 15" long choker, clasp marked Germany. Neat vintage 16 1/2" necklace, clusters of 4 strands small faceted beads, accented with larger beads. Vintage woven bracelet with flat red glass beads. Excellent condition. Very nice vintage 16" choker. Individually tied bead and signed made in Western Germany. 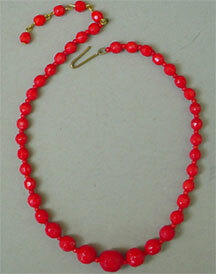 Vintage chunky hand blown red glass bead 16" choker. Black braided beads with ethnic looking medallion 16" choker. White & pink glass bead 16" necklace with glass clasp. Beads individually tied. Hand painted ceramic bead 16" necklace accented with brass beads. Blue crystal glass 14" choker. Really great 13" black crystal glass bead choker. Cute 14" red stone choker.